Learn more about the system of energy healing used at Starleaf Wellness, the Formula for Evolution, and how to engage in a practice. What Type of Energy Healing? When I tell people I’m an integrative, holistic practitioner who offers energy healing as part of my practice, a common question I get is “What kind of energy healing do you do? Is it like Reiki?” The short answer is no, it’s not. The two modalities could be put in the general category of energy healing but they are quite different. Many forms of energy work exist; some steeped in ancient traditions and wisdom, some more modern, flavored with new-age theory and perhaps even misinformation. When choosing an energy healing practitioner, it’s important for the client to resonate with both the practitioner and the modality for the work to be most effective. Read on and see if this work resonates with you! I work in the Western chakra and aura system first discerned by the Theosophists, expanded by the Berkley Psychic Institute, illuminated by the consciousness known as Seth, and taught by John Friedlander, and my mentor, Jill Leigh. The Western system delineates our energy into multiple energy bodies housed within us, each with different qualities and functions, but which integrate and inform each other and our experience. In my years of study with Jill, I have learned various energy clearing protocols specific to the Physical/Etheric, the Astral/Emotional, and the Mental/Causal energy bodies that can create huge shifts in awareness, behavior, and health. Perceiving these energy bodies clairvoyantly allows me to access and clear various forms of energy in very granular ways. People don’t have ‘bad’ energy. We all have preferences about what we’re attracted to, or not, and we resonate with different people based on who we are in our sovereign awareness. People who benefit the most from this system actively participate in learning about themselves in new ways and choose to practice skills on their own. We’re all here to do our own little piece of work in this lifetime. At Energy Healing Institute, we learn to call our little piece of work, “projects”. Our energy body carries these projects, and activates them when we’re triggered into acting or operating in concert with what we’re here to learn and evolve. As we learn to attend to, shift and clear our energy, we inform our awareness, and can fully let go of a project, moving on to other experiences and learnings. The idea that we’re stuck with our story isn’t true. We can learn to work with our energy body to set a new direction for ourselves, clear what isn’t useful, and evolve. When we let the story go, we’re free to create anew. 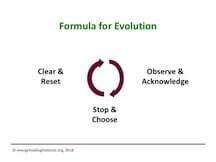 The process of working with clients is grounded by Jill’s Formula for Evolution. It holds my work with clients, and offers them a framework for the work they’ll do on their own. The next thing we do is set an intention for the work in the session. For instance, “I am embodied and present to myself and my life.” Then, we’re off and running! The client and I hold their intention while they relax on the table. I ask their energy to body to “light up” anything that is getting in the way of that intention. I assess the chakras and the aura to see how the energy body is “running”. After making needed adjustments to chakra and aura settings, we move on to overarching patterns, beliefs, emotional energy that are the root cause of the behavior. These can be held in both the chakras and the layers of the aura. As an integrated system, both need to be cleared and infused with clean, neutral energy so the energy body can be reset in present time awareness. To close the session, I give clients a few simple skills to support retraining their energy body to operate differently. I encourage them to observe their behavior; to notice and acknowledge the times when they derail. They can then stop the derailment and choose to affirm and return their focus and behavior to their intention. Taking a few minutes a day to clear and reset their energy body in between sessions helps speed along the evolution in their experience that they’re looking for. If you’re interested in learning about and working with your energy body in this way, contact me for an appointment. I’d love to hear from you! ← Energy Vampires: Stop The Madness!